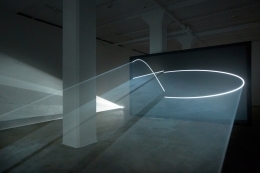 Sean Kelly announces Face to Face, featuring new and historic work by Anthony McCall for the artist’s first exhibition at the gallery’s new Hudson Yards location. Face to Face presents two large-scale installations by the artist: the eponymously titled light-based work from 2013, in gallery one, and Circulation Figures, the recently presented historical work from 1972, in gallery three. 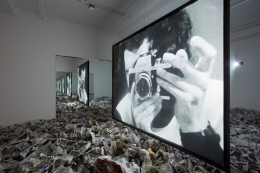 This exhibition marks the New York debut of both pieces. 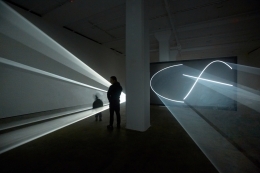 With Face to Face, McCall continues the development of his “solid light” works, a series of digital videos of meticulously choreographed intersecting lines and curves which are projected in darkened, haze-filled rooms, producing three-dimensional forms constructed of light. Until now, the imagery has been projected on walls or floors. For the first time, McCall’s linear forms are projected onto two-sided screens suspended in mid-air, facing each other across the room. The animated line drawings are visible from both sides of each screen, creating paradoxical similarities and inversions with the opposing screen on the far side. At the same time, the two large-scale volumetric forms, which can be inhabited or simply walked around, are seen in direct counterpoint with the original linear “footprint” drawings that produced them. 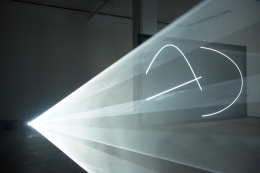 Anthony McCall’s work is included in several major public collections worldwide: the Tate Gallery, London; the Museum of Modern Art, New York; the Museé National d’Art Moderne, Centre Georges Pompidou, Paris; the Whitney Museum of American Art, New York; the Museu d’Art Contemporani de Barcelona; and the Museum für Moderne Kunst, Frankfurt. 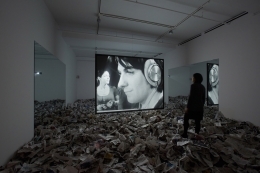 In 2012, The New Art Trust (NAT) announced the promised gift by Pamela and Richard Kramlich of all of McCall’s early solid light films and related material for presentation to the NAT’s three consortium members: the Museum of Modern Art, New York; the San Francisco Museum of Modern Art; and the Tate, United Kingdom. The artist’s recent exhibitions include Anthony McCall: Five Minutes of Pure Sculpture at the Hamburger Bahnhof, Berlin and Anthony McCall: The Complete Cone Films, Tanks at Tate Modern, London. 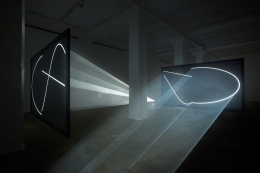 Current exhibitions include Anthony McCall: Two Double Works at the Kunstmuseum, St. Gallen; Light Show, at the Hayward Gallery, London (group show) and Solid Light Works - Anthony McCall at les Abattoirs, Toulouse, France, which opens on February 22, 2013. McCall’s early works on paper will be the subject of a comprehensive monograph, to be published in 2013, with an essay by Anne Wagner. Concurrently, in gallery two, Sean Kelly will present The Black Mirror, an exhibition of new paintings by London-based artist James White. 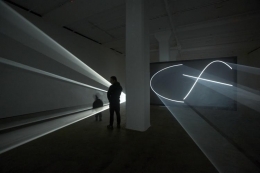 "Anthony McCall: 'Face to Face'"
by Ken Johnson, The New York Times , March 7, 2013.